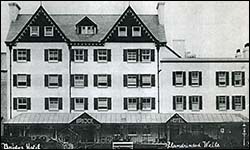 In the 1920s this became the biggest hotel in Wales, accommodating 250 guests at a time. It began in 1872 as Coleman’s Hotel and Commercial Boarding House, a three-storey building erected by Edwin Coleman, postmaster in the nearby village of Howey. It was expanded by the Wilding family, who took over in 1885 and renamed it the Bridge Hotel (pictured right) after a crossing of the Arlais stream behind the hotel. In June 1889 a lioness walked into the hotel’s drawing room! She had escaped from showman George Wombwell’s travelling menagerie, which was exhibiting exotic animals on the lawns opposite the hotel. The only guest in the room at the time escaped through a window, and the lioness was soon captured by her keepers. The last time the hotel was sold was in 1897, when Elizabeth Miles bought it for £7,850. She added a new wing, with space for 70 visitors, in 1899. In 1911 she bought job lots of carpet, cutlery and china from the Hotel Metropole in Cromer, Norfolk. They were monogrammed with the letter M, and she promptly changed her business’s name to Hotel Metropole! In December 1914 officers of the Royal Army Medical Corps moved in to the hotel. They included Major GJ Delap (pictured left) and his family. He was the commanding officer of the c.4,000 RAMC men who trained in Llandrindod Wells in 1915-16. In 1915 he was promoted to Lieutenant Colonel. In July 1915 David Lloyd George, the Minister of Munitions, attended a concert at the Metropole with his wife and daughter. He became Prime Minister in 1916. Another concert here, in 1918, raised £30 for the French Red Cross. Also in 1918 celebrity billiard player Claude Falkiner gave exhibitions of “snooker pool” and billiards at the hotel to raise money for the Soldiers’ Comforts Fund. 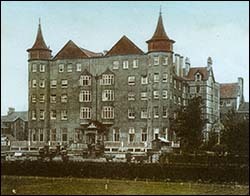 The hotel was enlarged again in 1923, using the site of Templefield House where Belgian refugees were housed during the war. The rear of the hotel (see right), with twin copper turrets, is more decorative than the front, because it was expected that the main road would be diverted there! The hotel still boasts some fine Art Nouveau décor, including stained glass. The army requisitioned the hotel again in the Second World War, this time for training of officer cadets. The hotel reopened in 1947 and is still run by descendants of Elizabeth Miles. Visitors can view the hotel’s timeline inside.